Primary Natural Resources bananas, cocoa, citrus, sugar, fish. 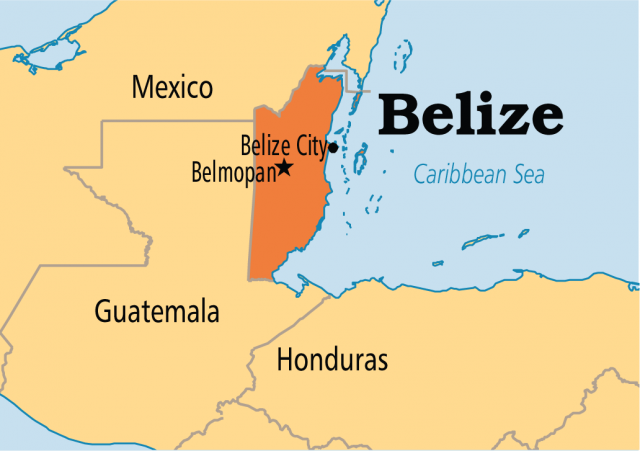 BELIZE (“BELICE” IN SPANISH), formerly the Settlement of Belize in the Bay of Honduras (prior to 1862), British Honduras (1862–1973), and Belize thereafter, became independent on September 21, 1981. Located on the Caribbean coast of northern Central America, it shares a northwestern border with the Mexican state of Quintana Roo, on the west with the Guatemalan department of Petén, and on the south with the Guatemalan department of Izabal. Honduras lies 46 mi (75 km) away at the two nations’ closest point across the Gulf of Honduras and CARIBBEAN SEA to the east. The current name is derived from the Belize River (also called the Old River) and Belize City, the country’s largest city, principal port, and former capital. The eastern border has numerous marshy lagoons flanked by the world’s second-longest barrier reef (240 mi or 386 km). The nation is shaped like a rectangle extending 174 mi (280 km) north-south and about 62 mi (100 km) east-west, with a total land boundary length of 321 mi (516 km); the border with GUATEMALA is 165 mi (266 km) and with MEXICO 155 mi (250 km). Cay islands include about 266 square mi (690 square km), and the Hondo and the Sarstoon rivers define most of the northern and southern boundaries. The western border follows no natural features but runs north-south through lowland forest and highland plateau. The entire area of the country is slightly larger than EL SALVADOR or MASSACHUSETTS. Geologically, Belize is divided into two primary physiographic regions, the Maya Mountains rising to 3,675 ft (1,120 m) and northern lowlands drained by 18 major rivers and streams. Most of Belize lies outside the tectonically active zone that underlies most of Central America. The climate is subtropical. Belize was under the political control of a series of Maya city-states prior to the arrival of English colonists in the early 1600s. A 200-year territorial conflict between Britain and SPAIN became a conflict between Belize and Guatemala, from the independence of Spanish colonies into the 1990s. Modern Belize consists of six political districts (Belize, Cayo, Corozal, Orange Walk, Stann Creek, and Toledo); the new capital, Belmopan, is centrally located in the interior. The country has a population that is fragmented into many racial and cultural groups. The two largest groups are Creoles; English-speaking or Creole-speaking blacks and people of mixed African and European heritage, and Mestizos, Spanish-speaking people of mixed Mayan and Spanish European heritage. In addition there are Garifuna (Afro-Caribs originally from the Lesser Antilles), Maya (descendants of the original inhabitants), East Indians, Chinese, Arabs, and Europeans. English is the official language, but a local English dialect, Belizean Creole, is spoken by most groups; Spanish is widely spoken outside of Belize City. Other languages include Mayan dialects (Yucatecan, Mopán, and Kekchí), Garifuna, and Low German. Most Belizans are Roman Catholic, but there are significant Protestant minorities.